The Wednesday winter storm had worked its way out of town by 6:15 a.m. Thursday morning, when I hit the road in the Bolt once again. 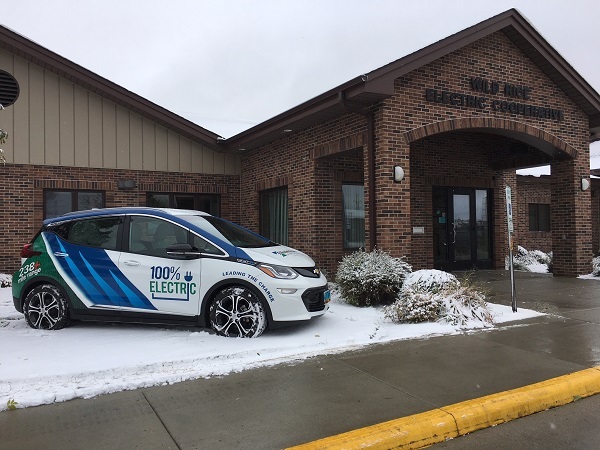 This time, I was headed 90 miles southeast to Wild Rice Electric Cooperative in Mahnomen, Minn. 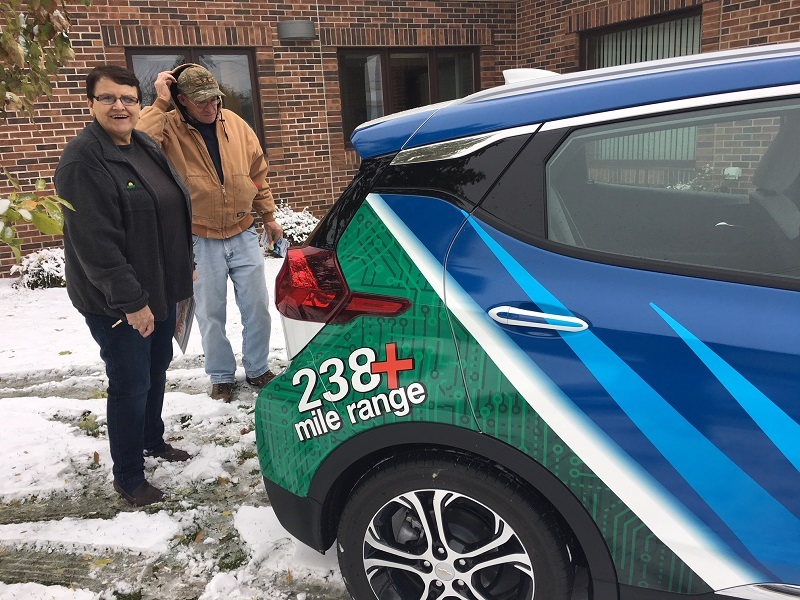 They had invited me to share what I know about electric vehicles for the "EV Day" of their weeklong Co-op Month open house. I was excited to get there, but a little nervous about the drive. The slush from Wednesday's wet snow was now iced over, so I would need to be especially careful. I knew from my highway experience the day before that the Bolt does well in the elements, but this would be a new kind of challenge. I tested the traction on a few empty stretches of road. They were slick, and I slid a little bit. The car didn't perform poorly, but it's certainly not magic – ice is ice, folks. I took it slow on the interstate and the less-traveled roads that would bring me to Mahnomen. I was also a little anxious about the range math running through my head. Since the last couple of Bolt trips had been energy inefficient due to interstate speeds of 70-75 mph, followed by a 100-mile trip through cold and wind, my expected full-charge range was only 162 miles – much less than the touted 238-mile average. I had 162 miles of range to drive just under 180 miles. Hm. This meant two things: I would likely need to charge for a while in Mahnomen (no Level 2 chargers there – a wall outlet would have to do), and it would be unwise to blast the cabin heat (even with an air temperature of 28 degrees). I knew that I would be driving more efficiently and would ultimately get better range than 162 miles, but I didn't want to take any chances. Instead of using the heater the entire way, I used a trick I learned online. Using the heated steering wheel and heated seats expends far less energy than the climate control. I could handle that! So I toasted up my hands and back (so luxurious), and that worked well for about half of the drive. But then I started to feel the cold on my nose and toes. It was time for real heat. I arrived at Wild Rice with 103 miles of range still on my gauge. Phew. It certainly leveled itself out. I would likely be fine to get home, but if I wanted to use heat the whole way, I figured I would be safe and plug in for a few hours. The Wild Rice team was too wonderful. I made them take a selfie with me. Some were happier about it than others. 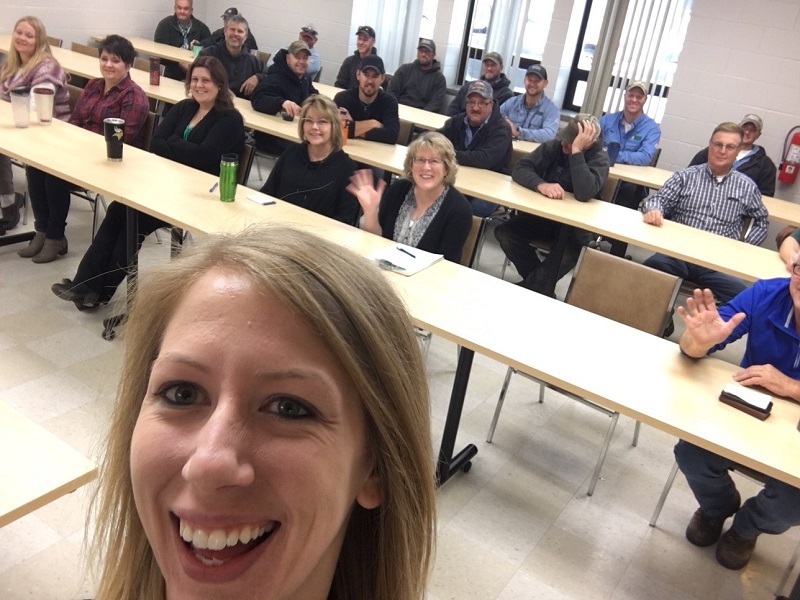 I started EV Day at Wild Rice's morning employee meeting, presenting what I've learned about EVs to a couple dozen staff and crew. It turned into a great conversation about community EV outreach and what it would take to get more charging stations in the area. 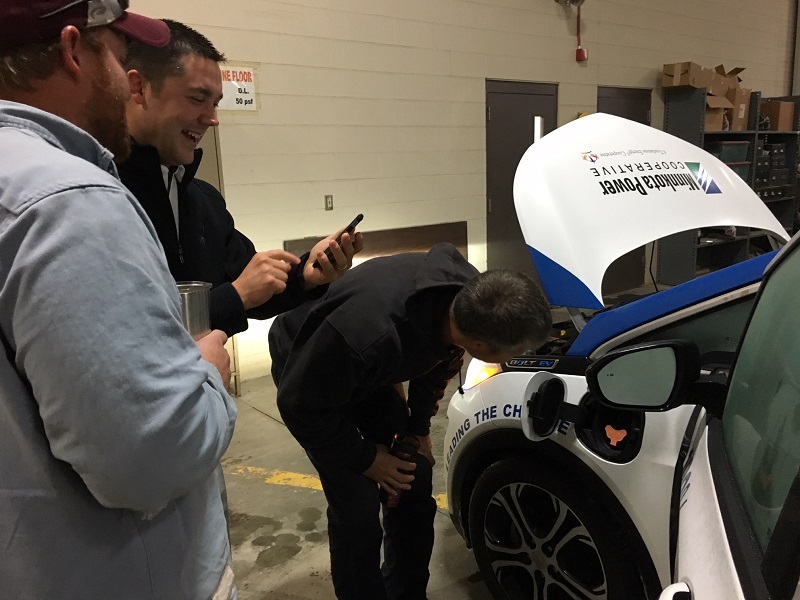 After the presentation, the Wild Rice team took the opportunity to check the car out in the garage. Being the kind-hearted Minnesotans that they are, they even gave the Bolt a quick wash – much needed after two days of winter driving. Thanks so much, Tommy and team! For it being so early in the morning, the crew was an energetic bunch, peppering their questions with jokes and photo ops. Oh, I see it now – everyone had coffee in their hands. That's where the energy came from. For the rest of the day, I was on hand in the office to answer questions about the EV parked out front. Members would pop in for coffee and a home-baked cookie (yep, more amazing cookies in Kaylee's belly), and I got to tell them all about my past few months with the car. Every time, it was like chatting with old friends – these folks were so kind and down-to-earth, and it was a joy to answer their myriad questions. The local paper even had a reporter stop by to learn more about the technology. Since I was parked right outside the door, members could pop in with questions and then pop out again for a personal walk-through of the car's features. I don't usually like to play favorites, but 89-year-old Leonard Hammer was my favorite Wild Rice member of the day. He came by just to talk with "the young lady with the electric vehicle" that he saw in his newsletter. 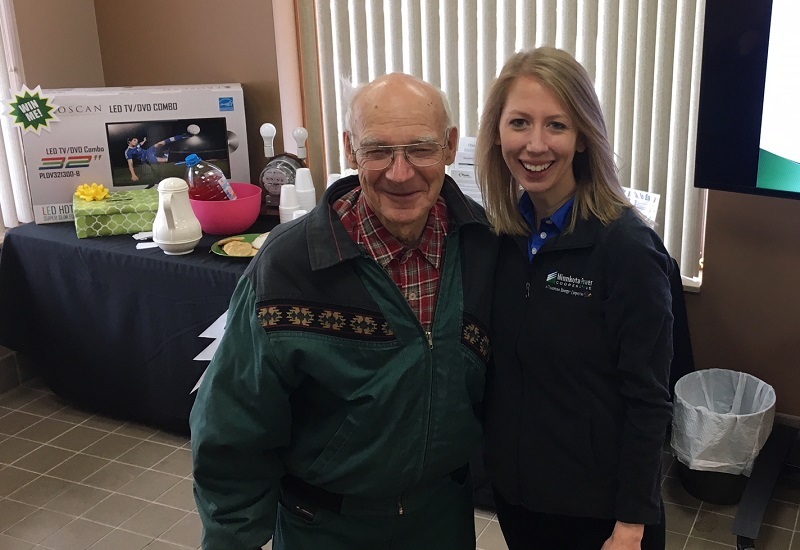 We shared a cup of coffee and talked about everything from fuel pumps to European electric buses to the future of power plants. The fun had to end sometime, so later in the afternoon I headed back to Grand Forks. Four hours of a 120-volt charge had added about 15 miles to my range, so I was feeling confident to use the heat most of the way back. At a balmy 33 degrees, the ice had melted from much of the route. After a wild couple of days of travel, this was the smooth sailing I'd been waiting for. We'll see what the next road trip brings!